There are now UK-based associates and “local” associates in West Africa, East Africa, Egypt and Ukraine. The local associates are based in British Council target regions in order to help embed the programme in the local landscape. 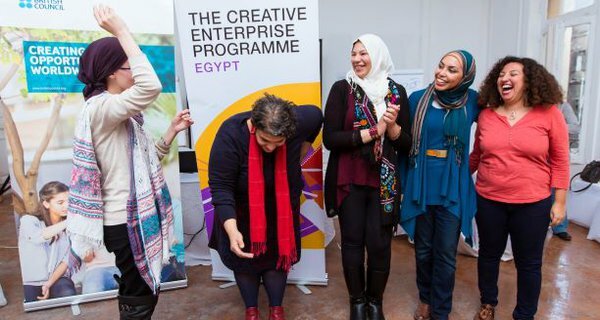 They do this by increasing reach to creative communities, drawing on real market knowledge, connecting with participants through shared culture and language, and maintaining longer term engagements with participants for maximum impact. We hope to recruit more local associates in further regions throughout 2018/19. The West Africa associates are all based in Nigeria, but deliver the Creative Enterprise Programme across a number of countries in the region. Here, we are excited to introduce the four Creative Enterprise Programme local workshop associates for West Africa. Left to right: Ifeanyi Enukorah, Victor Anoliefo and Wale Ajiboye. 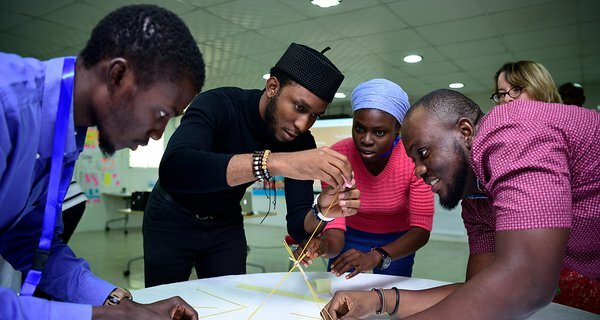 Ifeanyi is British Council Certified Master Trainer and has been presenting and facilitating customised interactive workshops since 2005 to audiences in Nigeria, the UK, South Africa, Kenya, Ethiopia and Sudan. He is valued for helping creative enterprises and teams think strategically and engage in meaningful conversations that allow for reflection and inquiry that lead to change. Over the last 10 years he has designed and facilitated meetings and retreats for the British Council in Nigeria and over 260 creative enterprises in the performing arts, fashion design and branding and has helped them align their values, clarify goals, and identify obstacles to change and achieve desired outcomes. Victor is the Founder and Quill Master (President) of the Abuja Literary Society (ALS). Victor is also the Vice President of the Conversations for Change (C4C) a non-profit agency with a major objective of empowering young people to participate more effectively in all relevant areas of development. Victor is committed to Nigeria’s democratic sustenance and has developed training programmes for the Democratic Skills Acquisition Project which led to a series of empowerment campaigns in the six geopolitical zones in Nigeria deriving from his experience at the socio-political re-engineering of the country through the Directorate for Social Mobilization. With undeniable passion for excellence and human capacity development, Victor constantly interrogates the frontiers of knowledge through interactive group activities that create enabling opportunities for development. Wale is an experienced innovation consultant providing advisory services to start ups and established entrepreneurs. He works with several organisations and individuals in the areas of organisational design, not-for-profit management, enterprise development, impact investment and innovation. His primary interest is in the areas of innovation and sustainability for entrepreneurs, particularly for those in the creative industry and companies using business for social good. Wale is very passionate about entrepreneurship and has immersed himself in helping entrepreneurs discover their creative genius, innovate and think global. He is also a Faculty member at the Enterprise Development Centre, of the Pan Atlantic University Nigeria, where he provides expert advice to growing businesses.